Have you been feeling emotionally triggered lately? If so, you are not alone. Energetic intensity has been a theme of 2017’s first chapter. Due to a convergence of cosmic factors and increasing planetary light levels, our issues are bubbling to the surface right now. We can see this happening on a personal and collective level, which is ultimately a gift to help us heal and release them once and for all. And the month of February always has a way of highlighting our emotions in bright neon yellow. Valentine’s Day is like a mirror that shows us what is happening in our hearts and relationships. It’s a time of reflection, in all senses of the word! If you don’t like what you are seeing, it is time to grab Unakite—a beautiful stone that clears old patterns on the emotional and physical levels. And if you do like what you are seeing, Unakite can expand the love in your life and make it even more beautiful. To continue reading this article, CLICK HERE!! Crystal Divination: What Does 2017 Hold in Store for You? Call in your higher self and move your consciousness into your heart. Take a few deep breaths, and then look a the image below. 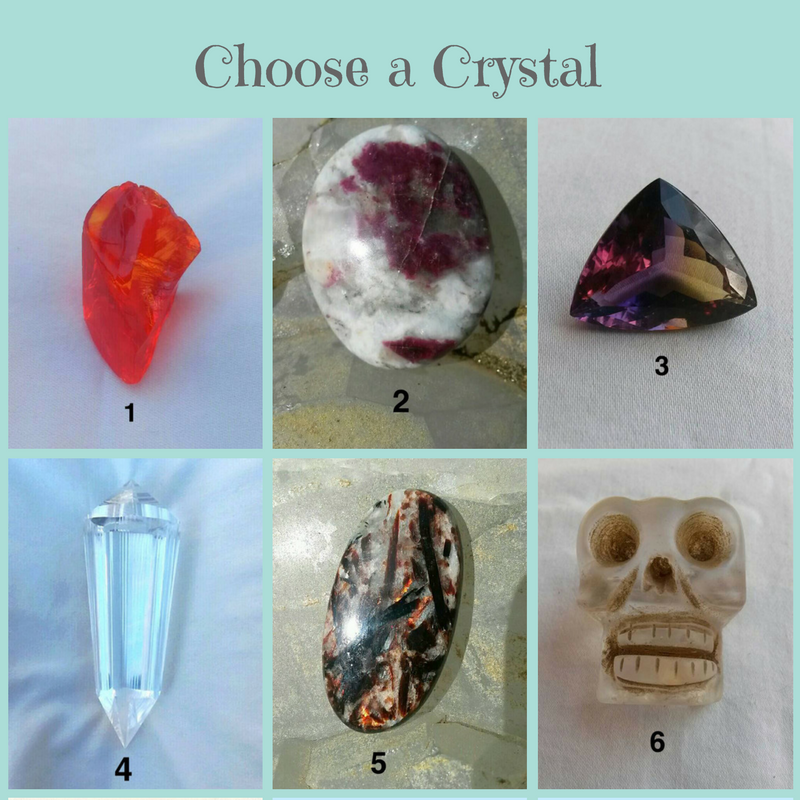 Which crystal are you most instinctively drawn to? Try not to analyze or think about it too much. Instead, allow in your higher guidance. Tune into your intuition, and feel out which one is calling to you the most. Once you have your number, look below the photo to access your mini crystal reading for 2017. (Having a hard time choosing just one? Try to narrow it down if you can. But go ahead and read the messages of any others you like, because they might also apply to you.) Enjoy, and remember that you always have the power to make your life beautiful! 1. Lemurian Sunrise Andara: A New Dawn–Lemurian Awakening and Vibrant Energy for a Fresh Start. Rise and shine! Brilliant new rays of light will shine upon you in 2017, inviting you to see the world and your life with fresh eyes. It’s time to leave the past behind and create a new chapter in your life. You are an advanced, dynamic, and gifted soul with a powerful mission to help make the world a better place. Life hasn’t always been easy, because you are on an accelerated course of healing and spiritual mastery. The Universe has recently given you at least one major challenge to help refine your heart, character, and soul. Here’s the good news: You have exceeded all expectations in dealing with it. Even if you haven’t always felt graceful in the process, the message is that your higher understanding of the situation, and your response to it, is right on track and has raised your light quotient. Old dynamics and patterns have been adequately transmuted in a fiery blaze, opening the door for new creations and experiences. This is the beginning of a bright era in your life, one that is infused with positive energy, spiritual awakenings, authenticity, and fun. 2017 is a 1 year in numerology, a time for new beginnings, and it is the perfect time to make significant life changes that will bring more passion into your everyday experience. You might need to take some time at the beginning of the year to rest and recharge your batteries after passing the tests of 2016. Portals are opening, and higher frequencies of light will be available to you this month that can revitalize and refresh your body, energy levels, and outlook. Visualize ruby-lava energy (the color of the Lemurian Sunrise Andara stone you just chose) and circulate it through your chakras and bio-energetic system as needed. Then you will be fully charged and ready to reinvent certain aspects of your lifestyle, moving your reality into a more authentic expression of your soul. You are encouraged to listen to your heart and to follow its truest yearnings and guidance. Make a conscious effort to daydream and to get in touch with ideas and inspirations that bring you joy and excitement. If there were no limiting factors, where would you choose to live? What would you like to contribute to the world? What change can you make to bring more joy, love, and fulfillment into your life? Getting clear on the answers to questions such as these will set in motion a chain reaction of synchronicities and opportunities that will positively transform your personal reality. Here’s another clue for you: Choosing this stone indicates that you are an old soul who has had several lifetimes in Lemuria. Lemuria was an ancient civilization that existed thousands of years ago in the Pacific. It was a paradise reality with a focus on love, unity, spirituality, and healing. 2017 ushers in a big Lemurian renaissance for you, a resurgence of the spiritual, psychic, and healing gifts you had in those lifetimes. Be open to this energy. Allow it to accelerate your spiritual growth and influence you to create your own version of a paradise lifestyle. Maybe your idea of paradise is to simply make certain aspects of your life more beautiful, such as your relationships, your home environment, your appearance, your soul. If you have always had paradise dreams of actually moving to a tropical island and enjoying glorious sunsets on the beach every day, it’s time to go for it! The wind is at your back this year, and your soul has the key to doors that were previously locked for you. Expect for things to fall into place like magic, as long as you stay in alignment. Get ready to co-create miracles, soul-inspired lifestyle shifts, major breakthroughs, and grand adventures that will land you in an entirely new energetic and physical territory by 2018. 2. Eudialyte: Upgrading your Psychic Senses and Perfecting the Heart. “Bzzzzzz.” What’s that sound? Is it that annoying ringing in your ears again? Maybe it’s a higher dimensional alarm clock trying to wake you up. Can you hear it yet? If not, chances are you literally might before the year is over. Your clairaudience (ability to hear multi-dimensionally) is coming online, along with your other psychic senses. You have always been a sensitive, intuitive soul who cares deeply about others and the world. You have spent lifetimes developing a beautiful, generous heart of gold. You have had incarnations as a monk, nun, or holy person, devoting yourself to service, compassion, and developing greater spiritual depth. You were also blessed with psychic and healing abilities in other lifetimes, and your gifts were sought after by many who heard of your powerful results. In this life, you have gone out of your way to help people in need–especially your loved ones. You have focused your love, prayers, energy, and time to assist with certain humanitarian causes and planetary issues, and it has made a bigger difference than you might realize. Your good deeds have been noticed in the Heavens! It has been decided that you are ready for more spiritual tools to expand your ability to help. You wrote it into your current life blueprint–the potential for these extrasensory gifts to come back online and stronger than ever. And 2017 is your year to take it to the next level. You have at least one new spirit guide joining your team at the beginning of the year to prepare you. The first order of business will be turning that big heart of yours inward and working on self-love. As a sensitive, you naturally feel things deeply and might have some residual emotions from past experiences that you need to process and to lovingly release. Some of the lower emotions and pain you are carrying might not even be yours! You might have subconsciously absorbed it from others in an attempt to lighten their load. It is time to let go of anything that is burdening your heart. Allow your loving soul to grace you with the vibration of forgiveness, which has the power to transmute anything that is less than love. You might experience another benefit from this heart-healing work: an improved romantic life or the manifestation of a soul-mate relationship. Be open to that potential! As you make progress on clearing and perfecting your heart, the psychic upgrade process will begin. You might get headaches and other ascension symptoms during the activation of your higher chakras and subtle energetic circuitry. And don’t be alarmed if you experience neck and shoulder pain at times. This is a sign that your Zeal Chakra is activating and coming into a higher level of functioning. The Zeal Chakra (also referred to as “The Mouth of God” or “The Well of Dreams”) is located at the back of the neck and the base of the skull, where there is an indention. It regulates multi-dimensional telepathic communication. As your Zeal Chakra awakens, you will experience an increase in clairvoyance, clairaudience, astral travel, vivid dream-recall, healing abilities, empathy, and telepathy. 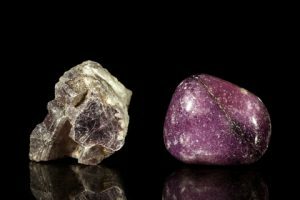 It is suggested that you work with Eudialyte at the Zeal Chakra this year to assist this process, and be sure to rest as needed. An important thing to ask yourself now is what will you do with these enhanced abilities. The good news is that it will be easier to hear the answers and guidance from your soul. Make some time to meditate and tune in. If you already do work in the metaphysical field, you might be given a new role or more advanced techniques to offer. If you have a more traditional profession or role in life, you might be given ways to incorporate these gifts into what you do. Or perhaps you will get a nudge to step out of your comfort zone and try something new. For example, if you ever considered taking psychic development classes or having a booth at a weekend metaphysical fair, go for it and see what happens! You are destined to succeed, as you have in many other lifetimes. 2017 will be a landmark year for you, as you step more fully into you spiritual power and your heart. Welcome to the next level! 3. Ametrine: Soul Integration, Forward Movement, and Diplomacy. You are a sparkling, multifaceted being with diverse and harmonious gifts–much like this crystal. The color rays in Ametrine (purple and yellow) are opposite of each other on the color wheel, yet they come together in a beautiful, complimentary way. They do more than coexist. The contrast actually seems to enhance the vibrant energy inherent in of each color ray, producing synergy and amplified radiance. This year marks a time of bringing various soul aspects and gifts together in an integrated, cohesive way that will make you unstoppable. You have it all within you: a sharp intellect balanced with keen intuition, feminine grace balanced with masculine strength, childlike innocence balanced with ancient wisdom. In your soul’s quest to fully understand this reality from multiple perspectives, a choice was made to diversity your resume of incarnations. You have had lifetimes in various cultures, with different levels of wealth and privilege and a wide variety of roles, gifts, and vocations. Your soul path has made you a jack of all trades. You are capable of excelling in many different areas, however sometimes this can lead to confusion about who you are and which path is best for you. The good news is that it will all come together for you this year. Your soul will bring you flashes of clarity and inspiration, and your highest path with be illuminated in bright lights. If you have been following different tangents or getting lost in distractions, this tendency will phase out and be replaced with laser focus. If you have any self-defeating habits, addictions, or patterns that have been standing in your way, this is the year for you to clear them once and for all. It’s a forward-motion year for you. After achieving a space of greater clarity, be ready to receive a series of major soul downloads. They are designed to activate latent talents and metaphysical abilities, while also bringing in higher-perspective information and solutions. You will begin to integrate the higher aspects of your soul matrix that are most helpful and relevant to your current mission, giving you access to the most important things you learned and mastered in other lifetimes. This will translate into success in your chosen endeavors and the manifestation of wonderful things. You will start to see new ways to combine different gifts that will create amazing results. Expect positive developments in your career, finances, health, and relationships. You have talents in the area of diplomacy and conflict resolution that will come in handy this year. From one perspective, we are currently in a phase of collective evolution that is marked by polarity and divisiveness. People are divided into different camps based on politics, religion, gender, race, region, social status, and other factors. The tension between groups seems to become more exaggerated every year, as if it is coming to a boiling point. This is happening for a reason. It is time for us to grasp a higher truth–that we are all truly ONE on the higher levels of reality! We are stronger when we listen to each other and embrace our differences, love and respect one another, and work together for the common good. This isn’t easy for everyone to achieve, but it is one of your specialities. Since you have had such a diverse array of incarnations, you are adept at seeing things from many different perspectives. On a soul level, you know what it is like to be dirt poor, filthy rich, beautiful, disabled, biracial, Ivy League educated, illiterate, an atheist, a Fundamental Christian, a shaman, etc. This makes you well-suited to be a peacemaker or a mediator who helps disparate groups achieve more empathy and understanding of each other. 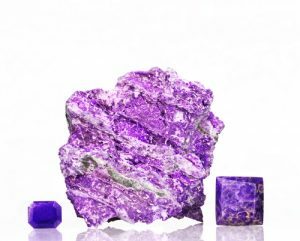 Thank you for modeling the energy of Ametrine–for showing us how to bring together opposites in a harmonious way that creates beauty and synergy. You rock! 4. Optical Clear Quartz, Phi Dream Vogel: Anchoring Crystalline Reality–Upshifting People, Places, and the Planet. Your soul matrix has a crystalline-like perfection and elegance to it. It’s very radiant, coherent, organized, refined, and geometric–just like the crystal you chose. Clear Quartz Vogel crystals are sentient, precision-cut tools that can access, store, and transmit an expanded spectrum of light for clearing, healing, and spiritual activation work. They emanate patterns of perfection that have a beneficial and evolutionary effect on people, energies, and the environment. And so do you! You are a brilliant soul who, on a higher level, is an adept in the fields of sacred science and mathematics. The truest essence of your soul is a Divine Architect and a Healing Technician. You understand sacred design and work with the energetic templates underlying reality to heal distortions and to create new forms. In fact, you are destined to be a part of the Divine Intelligence that helps to design original blueprints for new planetary systems. You have spent countless lifetimes refining your soul in order to move toward this elevated level of creative responsibility. You have had incarnations at the height of advanced civilizations on Earth, such as in Ancient Egypt and Atlantis, and you were trained in cutting edge technology and techniques that blended science and spirit. Your Atlantean incarnations were a shining accomplishment, as you engineered novel and effective ways to work with crystals for healing, rejuvenation, and technological progress. Even if this feels far removed from what you do in this lifetime, this expertise is imprinted in you–especially your connection with the crystalline kingdom. You have been acting as a human crystal your entire life–absorbing, amplifying, and transmitting higher frequencies of light–whether you have been conscious of it or not. You are a natural healer who can sense subtle distortions in the energy flows of people, systems, and places. Your higher self also knows how to access and apply the right energies to correct the imbalances. When you sense that the energy is off, your soul responds with mathematical precision in the subtle reams to fix it. That is why people who are having issues are oftentimes inexplicably drawn to you. If you are already working in the metaphysical or healing field, you are likely doing this work on a very conscious level and have a long list of amazed clients. But even if you don’t, your soul is still bringing rarefied energy into your daily routine that heals, restructures, and perfects the people and places that you encounter. You make the world a brighter place, beautifying and harmonizing everything that crosses your path. At times, you might have to remind yourself not to go overboard with your perfectionist tendencies, and it can be hard for you to fully rest until everything is in its proper order. But that’s what makes you excel and rise to the top in all of your life endeavors. Your gifts will certainly be in demand this year. The Earth is in the midst of a grand ascension process. New and progressively higher cosmic frequencies will continue to come into our planetary sphere in 2017, causing big transformation and upshift across the board. You will serve as a human Vogel crystal, expanding your dimensional receptivity to access the highest spectrum of incoming stellar frequencies and codes. You will absorb, integrate, and organize this energy. And then you will radiate the perfect rays, in the perfect amounts, that are required at any given moment for positive results. Allow your soul to perfectly guide you in this. You might be called to travel to specific vortexes and power spots to help upshift the ley-lines and planetary grid system. Perhaps your role will be transmit the right frequencies to assist with political, environmental, or social issues happening in the world. Or maybe you will work one on one with people to help them heal and awaken. No matter what you are specifically guided to do, it is recommended that you incorporate crystals into your spiritual work and process. Crystals will focus and amplify your efforts, helping you to create quicker and more impactful results. You could take classes about building crystal grids, programming Quartz for manifestation, or performing crystal healing sessions. But you have such a natural connection with the mineral kingdom that all you really need to do is tune in and listen. The crystals themselves will tell you how to best work with them. Thank you for being a true gem, one who is destined to help anchor crystalline reality for the planet in 2017. 5. Astrophyllite: “Walk In” and Wake Up to Your Galactic Mission. Hang on tight! It’s 2017, and things are about to get weird. But you’ll be OK, because weird is actually your comfort zone. Admit it, you find a lot of things about life to be a bit tedious and boring–like paying bills, cleaning house, preparing food, and generally maintaining your 3-D reality. Where are the replicators from Star Trek? Why do we have to get frisked by airport security and spend hours traveling in primitive airplanes when we could just jump into a portal and arrive in moments? These feelings are the price you pay for being a Starseed. A Starseed is an advanced soul who has had incarnations in other galaxies and solar systems, and on other planets. Choosing Astrophyllite indicates that you are one. As a Starseed, you are an accelerator of evolution. You have otherworldly, metaphysical abilities that become activated at the right time to serve the ascension of Earth and humanity. 2017 is one of the turning-point moments that you programmed into your life blueprint for a big activation of your abilities. It’s coming, and fast! You might already be well on your path, using your otherworldly spiritual gifts in planetary service. Or you might just be waking up to all of this stuff. Either way, expect a monumental upshift in your awakening and capabilities this year. You will likely gain a greater awareness of the Galactic aspects of your soul. Spending time in meditation might trigger conscious recall of lifetimes spent in other planetary systems (such as Arcturus, the Pleiades, or Andromeda) and what you learned and mastered there. There is a strong probability that you will take it a step further and have a walk-in experience. In your case, you would not experience the kind of walk-in where your soul leaves your body and is replaced by an entirely new soul. Yours would be an Oversoul walk-in, which involves a higher expression of your own soul essence stepping it’s frequency down to merge and integrate with your body and consciousness. Think of it this way: Your physical body is a finite vessel that can only hold a certain percentage of the vast amount of energy that makes up your Oversoul. Having an Oversoul walk-in is a way to send a more upgraded version of your own soul essence into your body. And in this case, the upgraded version carries your Starseed consciousness and abilities. That’s a lot to take in, literally! So expect a period of disorientation and adjustment that might last a few weeks or longer. The first order of business will be a necessary clean up project. You might have noticed that this planet has a few problems right now. As somebody who came here on a mission, you have willingly taken on some of the lower patterns and tendencies that are playing out here. You did this with the full knowledge that you would overcome them, and by doing so you are helping to transmute them for all of humanity. It is part of your path of service. You will be plunged into a process of facing any remaining shadow aspects in your life that still need healing. It might feel as if you are going through the dark night of the soul as old patterns, fears, thoughts, addictions and negative ways of being surface to be cleared. But don’t worry, because this new walk-in part of you is a master who will power you through it. It is suggested that you work with Astrophyllite to accelerate this healing process. Once you are on the other side of it, you will have a renewed sense of self and access to more of your power than ever before. Then it will be time to rock! Your job will be to maintain a daily, conscious connection with your soul and to follow any guidance you are given. You might be called to write a groundbreaking spiritual book, get involved in politics to change the system, invent technology to clean up environmental pollution, create a new healing modality, or simply to shower every bit of this Earth with the frequencies of pure love. Who knows what your mission is? Oh yeah, you do! Let your own masterful ET soul be your guiding star to amazing new horizons. Buckle up, and open your heart! This entire year has felt like a lesson in energetic acceleration and intensity, as our physical bodies are adjusting to progressively higher frequencies of light. And we are just getting started. September brings us two eclipses (one on September 1st and the other on the 16th), the equinox on September 22nd, and the 9-9-9 portal–not to mention that we are in Mercury retrograde for most of the month. Eclipses are always times of big shake-up, reset, and expanded dimensional receptivity. The fall equinox imprints us with the energetic theme of balance and encourages us to clear and release the old. It is also a time in which the veils are thinner and our psychic senses are heightened. September 9th is a power date that marks a major personal and planetary completion–a time of wrapping up old business and aligning with a brand new cycle. So if you are waiting for things to calm down, you might be out of luck. We are in the midst of the ascension process, and it looks like the beautiful Universe will continue to move us along by showering us with ever-increasing levels of light. Welcome to the new normal! Take a deep breath, and feel this truth in your heart: You came here to rock this cosmic opportunity and to be a part of the change–and you are doing better than you might think! You are growing and contributing to the collective in beautiful ways through all of your experiences. The key to navigating this intense month is to stay in your heart, to be as loving and gentle as possible with yourself and with others. Take time out to meditate and tune in to your higher self, and make an effort to support your body as it adjusts to all of the energetic shifts. There are three crystals that are perfect to work with in September and beyond to keep your vibration high, clear, balanced, loving, and aligned with ascension. Pietersite is one of the best stones for supporting and upgrading your entire bio-system during big cosmic events, such as eclipses and equinoxes. 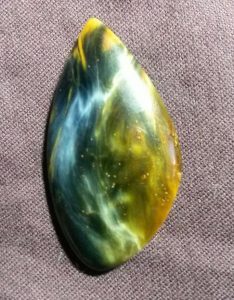 It is a beautiful stone with flashing color rays of deep blue, gold, brown, and grey that can activate the higher chakras and the solar plexus. Pietersite can ground higher frequencies of light into the body, and it helps to expand the spectrum of light that you can successfully integrate. It does so by strengthening the nervous system and brain, so that you can safely process more energetic input. Considering the big influxes of cosmic energy we keep getting, I highly recommend this stone to help your system keep up. Pietersite is also known to activate the higher glands, the pituitary and pineal, to create balance in the entire endocrine system. On a physical level, this helps to regulate hormones that affect metabolism, the reproductive system, blood pressure, and other biological processes. On an energetic level, it awakens and sharpens your intuition and psychic senses. 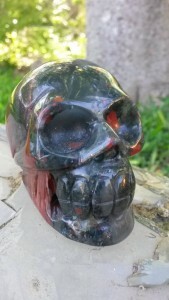 Working with Pietersite at the third eye will enhance meditation, visionary experiences, telepathy, and higher dimensional connection. Since it simultaneously activates the solar plexus (your center of will power and manifestation), it can help you to more consciously direct your psychic experiences and journeys. September gives us many windows of time in which the veils are thinner, making it a good time to meditate with Pieteresite to manifest healing, enlightenment, and positive breakthroughs. According to Naisha Ahsian, co-author of The Book of Stones, Pietersite resonates with storm energy. It has a powerful cleansing effect on the chakra system, the meridians, and entire auric field. It is especially useful for clearing out pent-up, emotional energy that has been trapped in your system. The fall equinox marks a time of letting go, and the 9-9-9 portal is about completion. Pietersite will help you to release all types of stagnant energy, old patterns, and blockages that you don’t want to carry forward into the next phase. Healing and refining your emotional body is the fastest ticket to higher dimensional living, and Watermelon Tourmaline is a beautiful choice for all matters of the heart. It is an elevating, striated gemstone that aligns with joy and Divine love, and it contains both the green and pink rays. 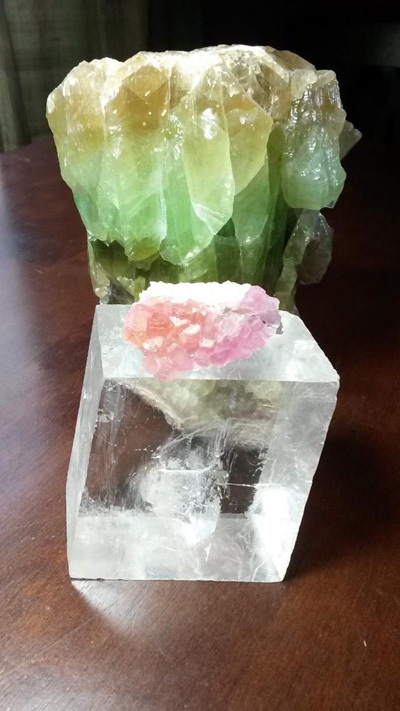 Watermelon Tourmaline helps us to balance and integrate polarities, especially masculine and feminine energies; and balance is a big theme of the upcoming equinox. Pink Tourmaline is a pure carrier of the feminine ray. It enhances the feminine qualities inherent in all of us: nurturing, receptivity, intuition, allowing, flowing, and cooperation. Green Tourmaline is a pure bearer of the masculine ray. It fortifies our masculine qualities, such as ambition, action, passion, stimulation, analytical thinking, and providing. Although pink and green are almost perfect opposites on the color wheel, the two colors come together in Watermelon Tourmaline and compliment each other in such a beautiful and pleasing way. They do more than coexist. The contrast actually seems to enhance the vibrant energy inherent in each color ray. The pink shines brighter next to the green, and vice versa. The combination produces synergy, an energy field of wholeness and amplified radiance that influences each of us to achieve the same. Watermelon Tourmaline is the perfect gemstone for activating the higher heart, since it contains both heart chakra colors and has a naturally high vibration. Located a few inches about the heart chakra, the higher heart connects you to higher levels of love–in the spectrum of Divinity, the soul plane, and higher dimensional realities. Activating your higher heart helps you to connect to more evolved forms of love that exist beyond 3D. It is a love that is accepting–without conditions, fears, lower emotional tendencies, or the need to control. It is the quality of love that helps you to forgive others, and yourself, so that you can truly heal from past emotional hurts. Watermelon Tourmaline has a high lithium content, which contributes to its heart healing, activating, and elevating energy. Lithium helps you to achieve a higher state of consciousness by naturally activating your third eye and intuition. It also has a calming and centering effect on the emotions. This makes Watermelon Tourmaline conducive to achieving meditative states, helping you to raise your heart and consciousness to the soul plane. Lithium also relieves lower emotional states such as panic, stress, anxiety, and depression. Working with Watermelon Tourmaline assists you in moving beyond these conditions so that you can get in touch with your higher feeling nature. Watermelon Tourmaline radiates pure joy and bliss, a vibration that can transcend and transmute all forms of negativity. During these transformative times, It is a perfect companion to help you heal emotional issues, balance all aspects of your being, and embody higher rays of Divine love. Charoite is one of the best stones to turn to when you are going through a major transformation process, since it can assist you on multiple levels of the being. 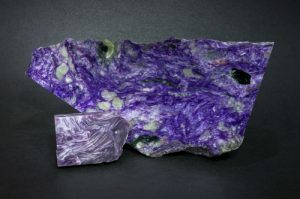 It is a beautiful stone to behold, with undulating shades of purple punctuated by black, white, and grey inclusions. The purple ray works with the higher chakras to bring in higher dimensional light for spiritual and psychic activation, and the black manganese inclusions have a grounding and balancing effect on the physical and emotional bodies. Like Pietersite, Charoite can help you adjust to higher energies, assisting your body to safely process, regulate, and ground them. This helps you to not get overloaded or overwhelmed by big influxes of light, which are prevalent in these times. If these higher energies are not properly processed by the physical body, uncomfortable physical ascension symptoms can result, such as headaches, digestive imbalances, dizziness, and fatigue. Charoite can help to prevent and relieve these symptoms. Charoite strengthens and heals multiple systems of the body and can even help to transform illnesses into wellness. The key to Charoite’s healing and transformative power is its ability to highlight the underlying causes and patterns that lead to imbalance. It brings the root causes into your conscious awareness, so that you can make necessary changes to correct them. It works with the heart to expand your love and self-acceptance, which is a catalyst for healing. It also lends the purple ray to help you clear and transmute them on a energetic level. Charoite has a powerful cleansing effect on the auric field, the chakras, and the emotions. It especially helps to release fear patterns that prevent forward movement. Now is the perfect time to do this deep-level healing and clearing, while the eclipses, equinox, and 9-9-9 portal are providing supportive energy. Energy reports keep coming out that say the final months of 2016 will be our most powerful yet. Remember, you’ve got this! Slow down, breathe, and practice good self care. Reach for love, and for these three crystals, to help carry you through it all with ease and grace. Many of us have caught on to the idea that there’s something special about this lifetime. There’s an urgency to go for the gold and to make it count. Due to a convergence of cosmic factors and increasing planetary light levels, we are on an accelerated course of spiritual evolution. It can feel as though we are accomplishing several lifetimes worth of lessons in the span of just a few years. To awaken more of the gifts and superpowers of our souls, we have to do the dirty work—we have to cleanse and clear the old belief systems, emotions, patterns, and blockages that are holding us back. And we have to maintain a level of energetic clarity to allow the light to flow and reside within our bio-energetic systems. I think I have an energetic allergy to brooms, mops, Mr. Clean, and SOS pads. Just the thought of my cleaning supplies makes me dizzy and weak, and I find that I just can’t seem to get off the couch. Luckily, it is easy to keep your energy clean and sparkly with beautiful, safe, and natural tools—crystals! There are literally hundreds of crystals and stones that can have a clearing effect, but I’d like to share with you my top three recommendations for some serious deep cleaning. Covellite a metallic, indigo stone that resonates with the third eye chakra and has a powerful vacuum cleaner effect for your mind, body, and spirit. It has a specialty of clearing the higher chakras and spiritual levels of the being. Covellite gets to the karmic root of issues that are plaguing you, and it can assist in clearing thought-forms and beliefs from this life and from other lifetimes. It brings greater understanding of why certain situations have manifested in your life based on your entire soul history. Covellite then brings in higher dimensional healing energy to clear and transform these patterns once and for all. In addition to clearing your energy, Covellite awakens your psychic and spiritual gifts to a higher level, making it a must-have stone for these times. Covellite is called the blue healer. It has the kind of vibrational flexibility that allows it to connect to the highest levels of the being, while also reaching into the gross physical level and assisting with healing miracles in the body. Melody, author of Love is in the Earth, suggests it to support the healing of cancer. I have personally seen Covellite help a client to beat cancer, and I believe that it is just as effective with other serious illnesses that have a karmic cause. It can have a detoxifying effect and can support healing on a cellular level. Dioptase is a green copper silicate stone with sparkling energy and powerful cleansing effects—especially on an emotional level. If you have experienced or are experiencing any abuse, trauma, or unpleasant emotional events in your family, or have interpersonal relationships that feel karmic or dense, Dioptase can help! Dioptase can make you aware of any emotional attachments, cords, contracts, or blockages and where they are located. It leads you to identify what is going on and to dissolve and clear these negative patterns and cords. The clearing that Dioptase does can ripple through several lifetimes at once, and can even clear genetic patterns. Since Dioptase contains both copper and silica, it works in an even deeper and more powerful way and really gets to the root cause of issues. Once you can see the higher truth behind an emotional blockage or cord, it becomes easier to forgive and release the entire situation. As a side effect of clearing these stubborn cords and emotional blockages, you might also experience physical body healing. Shungite is a miracle stone from Russia that is about two billion years old. It contains rare fullerene molecules. Fullerenes are molecular carbon cages that form into the sacred geometrical shape of the dodecahedron. They were recently discovered in the 1990s, and scientists are still determining the multitude of applications of fullerenes in fields such as nanotechnology, healthcare, and environmental sciences. Many sources say that fullerene molecules are detoxifying, antibacterial, anti-inflammatory, and can assist in healing a wide range of physical complaints. 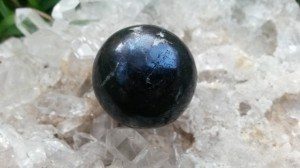 Working with Shungite can therefore speed up the natural physical healing process, and it also offers pain relief. As a crystal healer, I am quite impressed with its clearing, purification, and protection qualities. It neutralizes many forms of negative energy, including lower emotions and thought-forms, toxins of all kinds, and EMFs. Scientists have demonstrated that Shungite can significantly decrease the detrimental effects of cell phone radiation on the human body. 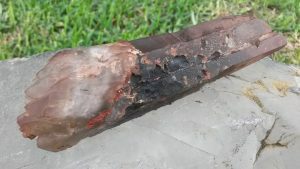 Shungite is also used in Russian water purification systems to remove harmful substances such as bacteria, pesticides, heavy metals, and pharmaceuticals. It can correct many imbalances in the auric field and in the emotional body, while enhancing vitality and general well-being. Wearing one or more of these stones in the form of jewelry or carrying them in your pockets is a good way to keep your energy clear throughout the day. Or if you feel like you really need to do some deep release work, here is a technique you could use that puts them all together. Begin by obtaining one Covellite, one Dioptase, and one Shungite. Cleanse them, and then call in your higher self and spirit team. Ask them to assist you in clearing what no longer serves you and creating highest good and outcome. Place the Covellite over the third eye chakra, located at the center of your forehead. Next, place the Dioptase over the heart chakra, located at the center of your chest, and then place the Shungite at the root chakra (public bone area). After the stones are in place, bring your attention to the Covellite at the third eye, and hold this intention in mind: “I am now ready to become aware of any lower thought forms, mental patterns, and beliefs that are holding me back.” Take some more deep breaths, and just allow your higher self and the Covellite to surface what you need to know. You might have a memory surface from this life or another life that will reveal to you the energetic blockages or belief patterns you have been holding. You might just get a subtle feeling or knowing. Advice or guidance about how to shift it might also come to you. Be sure to take note and follow through with any ideas you might receive. It is also possible that you might not get anything significant on a conscious level, and that is OK, too. Trust that you are creating healing for yourself, and that it is unfolding perfectly for your highest good. 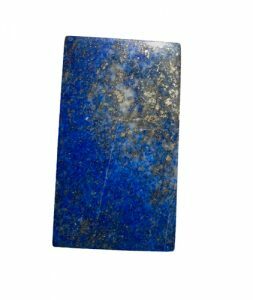 Once you feel complete with receiving information, you can place your hands on the Covellite and hold the intention that it is absorbing any lower energy and patterns. If you are sensitive, you might even feel this happening. 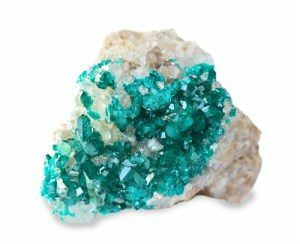 Next, place your hands on the Dioptase at the heart chakra, and hold this intention in your mind: “I am now ready to acknowledge and clear any emotional attachments, cords, contracts, or blockages that are holding me back.” Once again, breathe deeply and allow any old emotions or relevant information to surface. You might feel a wave of unprocessed emotional energy from the past or become aware of unhealthy emotional dynamics that need to shift. Take note of any guidance you receive, and allow the Dioptase to absorb and clear anything that is not serving you on an emotional level. Finally, place your hands over the Shungite at the root chakra, and hold this intention in your mind: “I am now ready to clear negative energy, entities, toxins, or EMFs that I may have picked up from my surroundings.” Take some deep breaths, and imagine that you are sending Shungite energy throughout your entire body and auric field. Visualize this energy neutralizing any negative energy that it touches, transmuting it into pure light. Leave the stones in place for at least fifteen minutes, and allow them to do their magic. Be sure to cleanse the stones after this exercise. May your energy and your life always be crystal clear! You experience a feeling of homesickness and don’t feel truly at home anywhere on Earth. You think or dream about UFO’s and extraterrestrials often, or you have actually seen UFO’s. You are very empathic and sensitive to your surroundings (lights, textures, sounds, toxins, temperatures, people, energies, etc.). You need alone time maintain your balance. Your body functions a bit differently, and medical doctors might not have answers for you. You have natural psychic, intuitive, healing, or metaphysical abilities. Children and animals are naturally drawn to you, but adults may be wary of you (unless they are open-minded or need healing and assistance of some kind). Life and society on Earth feels a bit limited, boring, and primitive. You have a hard time witnessing systems that harm the earth and people, and you can visualize a better way. You have always felt like an old soul who is different and who has an important mission, even if you don’t know exactly what it is. You are intelligent and excel at problem-solving, technology, or science. You experience quantum leaps in your growth, healing, and spiritual understanding. You get to new levels faster than most people. Starseeds have otherworldly, metaphysical abilities that become activated at the right time to serve the ascension of Earth and humanity. The light codes, energetic signatures, experiences, and gifts from ET lifetimes are etched into the soul matrix of Starseeds. They are accelerators of evolution. It is their job to awaken and to understand their unique abilities, and to step into their role as an agent of transformation for others and for the word. If you are a Starseed who needs a little help in that department, there are five crystals that can awaken your stellar memories and gifts–helping you execute your mission like a rock star! Blue Apatite is a stone of psychic activation and cosmic connection that makes you clearer, brighter, and more tuned in. It is helpful to Starseeds who are awakening for several reasons. It has a pronounced clearing effect that has a refreshing, flowing quality to it. It clears chakra blockages, emotional states, deeply engrained patterns, and psychic debris in the aura. It has a balancing effect on the chakras and the layers of the auric field. And It can expand and sharpen all of the psychic senses (clairvoyance, clairaudience, clairsentience, claircognizance, telepathy, channeling, etc.). In meditation, Blue Apatite can help you to become a conscious time-traveler and to tune into your Akashic records. Imagine being able to clearly access your ET incarnations, bringing solutions and advanced knowledge into this now moment! If you work consistently with Blue Apatite, you can develop the clarity, balance, and psychic ability necessary to connect with your soul history and achieve this. Blue Apatite is also recognized as a magnet for UFO’s and ET consciousness. Robert Simmons, co-author of The Book of Stones, says that Blue Apatite can attract the attention of the “blue-skinned beings,” and my personal experience confirms that it can help you tune into the blue ET races. Certain groups from Andromeda, Arcturus, the Pleiades, Sirius, and Vega are blue beings, and so are the Blue Avians. When inviting ET connection, I find that it is best and safest to call the parts of your own soul that are positively-oriented extraterrestrial, rather than sending out a general call to any aliens who might be flying around out there (for obvious reasons). Be crystal clear about who you want to connect with, and have a higher purpose for doing so. 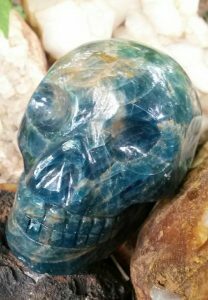 For example, I work with my Blue Apatite skull (pictured here) to bring in my own Pleiadian soul aspects for the purpose of healing work. And I have had some amazing results! Moldavite is a green tektite, known as the gemstone born from the stars. It is the quintessential Starseed stone, since it is literally a merging of extraterrestrial energy and Earth material. Moldavite’s formation is the result of a meteorite crash that occurred in Czechoslovakia around 14.8 million years ago. It has a very high spiritual frequency that can often be felt as heat or vibration. Moldavite can be intense for the average human. But Starseeds normally feel right at home with the cosmic energies of Moldavite, and it can help them to adjust to the density of the Earth plane. Moldavite can also help Starseeds to fulfill their purpose as accelerators of evolution–which is ultimately what they are both here to do! Moldavite is a quantum leap stone, helping you to rapidly shift your vibration and your life circumstances. Here’s how it works. It brings in high frequencies of light that activate and clear all chakras and the entire energy field. Your light quotient is raised to a new level, and anything that is incongruent with your highest good will start to fall away. This could include relationships, your job, your living space, roles, patterns, and habits. This purging process is followed by a positive flow of synchronicities, new connections, and bright opportunities that are in alignment with your true mission. Moldavite also quickly activates your higher chakras, psychic senses, and spiritual gifts. Higher abilities relevant to your unique purpose begin to come online, such as intuitive knowing, telepathy, multidimensional travel, remote viewing, or energy healing. Moldavite is especially known for enhancing meditation and dreams, helping you to have vivid encounters with higher dimensional beings, ET’s, and your own soul. Starseeds often have a specific mission, and sometimes it is so abstract that it can be difficult to grasp. 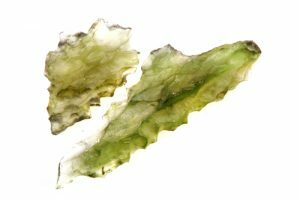 Moldavite can help you to remember your star origins, why you came here, and what you wanted to accomplish. Then it brings in the energy, insights, and activations necessary to help you make it happen. Stellar Beam Calcite is a Starseed’s vehicle for accessing the stars and actualizing higher dimensional living. The crystalline formation of Stellar Beam Calcite models for us a grand spiritual potential–the possibility of making big shifts and changing your outer reality to a more refined and spiritually-focused expression. As crystal expert, Katrina Raphaell explains, most Calcite manifests in the shape of a rhomboid or parallelogram–both internally and externally. Stellar Beam Calcite has an internal structure that is a rhomboid, but its outer shape (and energy) resembles a spaceship. The sharply pointed terminations give it an added intensity, focus, and energetic range. 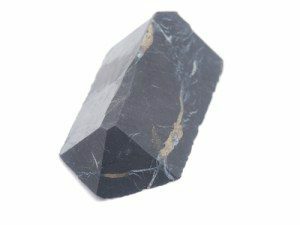 Since Stellar Beam is the Calcite that has evolved the rhomboid to an entirely different shape, it represents “the manifestation of the new reality.” It is the perfect support stone for Starseeds, helping them to bring transformation, galactic energies, and higher ways of being to the Earth plane. Stellar Beam Calcite has a noticeably high and fast vibration that can give you the feeling that you are about to take off into the cosmos. It produces a quickening effect on the cellular and atomic levels. It activates your DNA and light body, awakens your psychic senses, and raises your light levels. Stellar Beam Calcite is like a ship for your consciousness, safely escorting it to the ET realms. It can connect you with the guidance and energy of your Star family and your Starseed aspects—Pleiadians, Sirians, & Arcturians especially. I have used it to help me access healing frequencies from advanced ET technologies, causing instant healing in some cases. 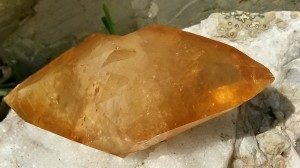 When I work with Stellar Beam Calcite, I always think of Captain Picard from Star Trek and his famous line, “Make it so!” Since it powerfully activates the solar plexus chakra, Stellar Beam Calcite is a “make it so” stone that can create quick manifestation results. It is especially well-suited for manifesting healing on all levels, clearing of all types of negative energy (blockages, entities, attachments, and implants), spiritual breakthroughs, and the actualization of your highest soul mission. Are you ready for take-off? According to Patricia Troyer, author of Crystal Personalities, an ET (extra termination) crystal is a quartz that has multiple points or terminations on one end. It actually looks and behaves like a rocket ship. ET crystals symbolize Universal connection and can help you communicate with ET consciousness. They can also represent the merging and integration of your other lifetimes and soul aspects. Each small termination is like one of your incarnations, and it contains all of the gifts, light codes, and mastery you attained in that lifetime. They all come together in one crystal and can be focused through the lens of your current incarnation, which is represented by the single point or termination at the other end of the crystal. In my experience, ET crystals are very multidimensional and can even defy the laws of physics as we know them. For example, I have had an ET crystal bend slightly in my hand for a split second on a few occasions, and other people who handled the crystal experienced the same thing! They can serve as antennas that help you receive cosmic transmissions and information. The can also be used as wands to direct this galactic energy for healing and activation work. They help you access and bring through cosmic symbols, activation codes, and light language. ET crystals can also assist with revitalizing your energy or space, while providing protection. It has a special resonance and connection with cosmic energies and beings. 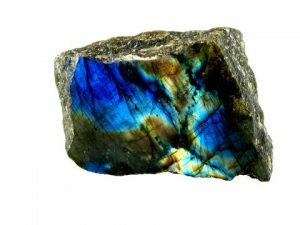 Melody, author of Love is in the Earth, explains that the flashing luminescence in Labradorite is believed to have an extraterrestrial origin. Stellar energies are seeded within Labradorite, and this advanced ET energy and information is available to those who work with it. Labradorite grounds this spiritual and stellar energy into your bio-system and consciousness so that you can use it in tangible ways. It also keeps your chakras and aura clear, balanced, and protected. Starseeds arrive on this planet like shooting stars, leaving a trail of magic and light that dazzles and uplifts all witnesses. Work with these five crystals to activate your galactic gifts, and your soul will become a guiding star for humanity during these pivotal ascension times. Being an empath is a beautiful gift and a spiritual superpower, although it might not always feel like it. An empath is somebody who is able to feel the emotions, the energy, and even the physical pain of others. They tend to have a heart of gold and a highly developed intuitive sense. This heightened level of sensitivity and perception can make an empath shine as a healer, a counselor, or in any helping profession. Literally feeling what others are experiencing can guide you in how to best assist them. Perhaps that’s why so many people are drawn to empaths! A challenge for empaths is to learn to distinguish which emotions, pains, and thoughts belong to others, and which are their own. Protection is key for empaths to help them avoid becoming overwhelmed and drained. It is also helpful for them to have skills and tools to release negative energy and emotions they may have picked up. As the cosmic and planetary energies continue to intensify, the need for empaths to practice good self-care becomes even more important. Thankfully, there are four powerful crystals that provide perfect support for empaths and sensitive souls. Rainbow Fluorite is a multitasking powerhouse that can help empaths on all levels of the being. 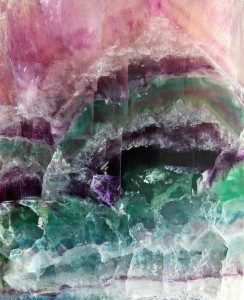 Fluorite is one of the magical minerals that can be found in a wide range of colors: pink, magenta, white, purple, blue, green, yellow, red, and black. Rainbow Fluorite has multiple colors in one stone. This means that it is equipped to clear and balance multiple chakras simultaneously. Sacred geometry also plays an important role in the energy of Fluorite. Fluorite naturally forms in the shape of the cube and the octahedron. The cube helps to structure and organize energy, while grounding and protecting you. The octahedron resonates with balance, healing, and spiritual activation. For all of these reasons, Rainbow Fluorite is the stone that keeps your feet anchored to the Earth, all of your chakras open and clear, and your consciousness attuned to the higher dimensions of reality. This is essential for empaths, so that they stay centered, grounded, protected, and tuned-in. If some (or all) apply to you, you are in good company! These are some of the most common ascension symptoms that my clients and friends have been reporting. It is always advisable to seek medical advice from a qualified doctor or holistic practitioner when you aren’t feeling normal, just to be on the safe side. If you determine that there are no medical reasons for your symptoms, it is likely that you are simply going through a spiritual growth spurt. Luckily, it is temporary, and it is a sign that you are on the right track. And thankfully, there are four powerful crystals that can help you move through these symptoms with greater ease, speed, and grace. Amethyst is a beautiful antidote to almost every ascension symptom due to its calming energy, clearing effect, and ability to raise your vibration and state of being. If you want to work with the most powerful form of Amethyst, I would suggest Auralite. Auralite is a rare form of Amethyst with Chevron Phantoms that is found in the Lake Superior area of Canada. It is estimated to be 1.2 billion years old. 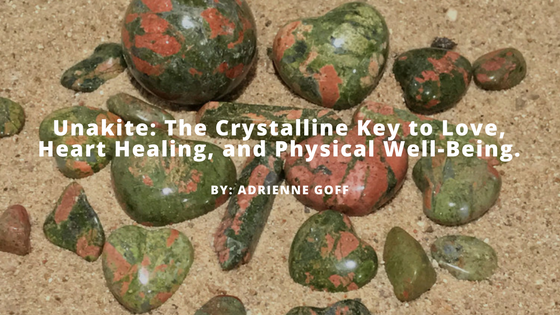 What makes it so special is what’s inside: an array of rich, plentiful mineral inclusions that give it the versatility to treat a wide range of energetic, emotional, and physical issues. The minerals present as inclusions have been studied by optical crystallography and include the following: Lepidocrocite, Cacoxenite, Goethite, Pyrite, Bornite, Chalcopyrite, Gold, Silver, Platinum, Uranopilite, Covellite, Sphalerite, Copper, Limonite, Pyrolusite, Adularia, Hematite, Epidote, Magnetite, Titanite, Rutile, Gersdorffite- Platinum series, and Tyrolite. 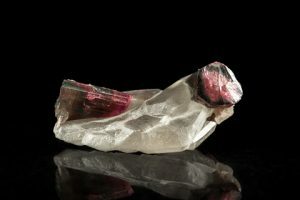 This is a crystal that forms a personal connection with you, and it will adjust and respond to the immediate needs you might have in your spiritual growth process. Auralite acts as a guiding force, helping to make whatever shifts are required to bring you to a higher level–whether its clearing blockages, manifesting resources, releasing old emotions, or shifting your beliefs and consciousness. 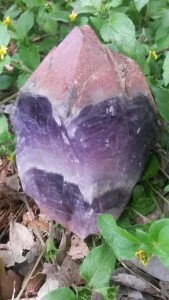 I have personally witnessed the following effects in my work with Auralite: instant activation and balancing of all chakras, sudden insights, alignment with the higher self and soul plan, activation of the divine blueprint, and the strengthening of psychic abilities. Auralite is especially equipped for alleviating ascension symptoms in the emotional and mental bodies, such as stress, anxiety, panic attacks, tension, depression, anger, and lower emotional states. It is also the best choice for headache relief and for clearing the energetic root causes of physical body symptoms. It brings in higher energies of peace and calm, and it helps you to unwind areas of constriction on all levels. Sometimes what you need most to overcome these ascension symptoms is to strengthen and support your physical body, energetic structure, and attitude. Bloodstone is a dark green form of chalcedony that normally contains spots or streaks of Red Jasper. Known as the stone of the spiritual warrior, it will keep you grounded, present, vital, protected, in your power, and responsive to any challenge that intense energies might bring up. If you are feeling the effects of ascension symptoms mainly in your physical body, Bloodstone is a good choice for you. Bloodstone is a top level healing stone that detoxifies and fortifies many systems of the body. It can boost the immune, endocrine, reproductive, lymphatic, and circulatory systems. A stone of well-being and vitality, it strengthens the root chakra and physical energies. This gives it a rejuvenating quality that can support you through a health crisis and speed up the healing of any physical symptoms you are experiencing. Bloodstone is especially helpful if you are feeling fatigued, exhausted, and drained. Bloodstone can also assist you on an energetic and emotional level with ascension symptoms. It is known to help your bio-system integrate shifts in your energy field, especially surges of higher frequencies. As your body is aligning to the new energy, Bloodstone can have a balancing effect that keeps anxiety and disorientation in check. It can help to clear lower energy and emotional states that get stirred up in the process, such as anger, irritability, and fear. It calms and sharpens the mind, while helping to bring out a positive, encouraged attitude. During periods of spiritual growth, it is common to feel vulnerable and open. Bloodstone keeps you protected from lower energies and outside influences, creating a safe space for your transformation process to unfold. A lot of people are feeling anxious, worried, and overwhelmed as a result of the shifting energies. Anger, irritability, and mood swings are also prevalent, and it can be difficult to maintain your emotional balance. Kunzite is a sweet, high vibration stone with a light pink color and a high lithium content. Crystals and stones containing lithium naturally emit a calming energy that can counteract feelings of panic, worry, anxiety, stress, and anger. Kunzite balances your mood, while delivering loving, peaceful vibrations from the higher realms through its striated structure. A striated stone is one that has parallel grooves recessed down the length of the stone. The striations in Kunzite act as amplifying channels or pathways for higher frequencies to enter your bio-energetic field for clearing and activation. Kunzite can help to clear depression, old emotional wounds, trust issues, and other patterns that block the full expression of the heart. It brings you more fully into your heart, perfectly positioning you to move into greater alignment with the higher realms and ascension. 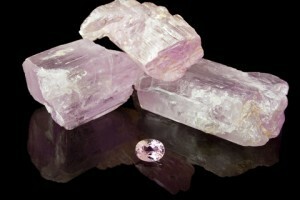 Kunzite also encourages appropriate boundary setting and provides energetic protection. This helps you to stay centered in your own energy and to be less affected by other people and your environment. If you are experiencing aches, pains, and stiffness in your body (especially in the joints), Kunzite can help to soothe and clear these ascension symptoms. 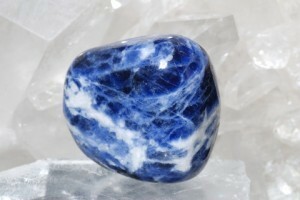 Sodalite is a beautiful stone that has deep to light blue color rays and areas of white Calcite. It is ideal to assist with ascension symptoms related to mental, spiritual, or emotional imbalances. Sodalite stimulates the mental body and brings order and organization to energy, thoughts, and words. This makes it especially helpful in counteracting feelings of confusion or disorientation that can occur due to shifting energies. Sodalite can help to clear old, rigid thought patterns that would block your ability to comprehend things in a newer and truer way. It can help to open your mind, while shifting your mental body into greater alignment with higher truth. Sodalite also sharpens your psychic vision and intuition, so that you can see situations from multiple levels of reality and draw accurate conclusions. It awakens the third eye chakra and expands your spiritual awareness. During a spiritual growth spurt, this expanded perspective can help you to understand and process your karmic lessons so that you can move forward with ease and grace. Sodalite also has a peaceful and relaxing quality to it. It can calm and unwind uncomfortable emotional states, such as fear, stress, anxiety, guilt, and anger. Sodalite can also help to relax a revved up mind so that you can more easily move into a calm, meditative state. Since it slows down excessive mental activity, it is great for alleviating the prevalent ascension symptom of insomnia. If you are experiencing hot flashes or heat waves, Sodalite has a cooling effect that can bring your system back into a balanced, comfortable state. No matter which ascension symptoms you are experiencing, these four powerful stones will have you covered! Keep them nearby, and allow them to help you power through this phase of your evolutionary process. Top Nine Reasons to Work with Calcite in March–and Beyond! I am somebody who always pays close attention to my dreams. I know that my soul and subconscious mind can use dreams as a vehicle to bypass my waking consciousness and deliver important messages. This is especially true during powerful energetic windows, such as the one we are currently in. March brings us two eclipses and an equinox, which can accelerate our spiritual growth process and draw a lot to the surface for healing. Last week, I had a powerful healing dream. I was on a surgical table, and higher beings were performing a major surgery on my heart chakra. I felt vivid sensations in my body, and also a great sense of peace. I knew it was an upgrade, and I was very grateful. One of the beings kept telling me repeatedly, “Remember Adrienne, work with Calcite to support the repatterining of your heart. Don’t forget this when you wake up.” I woke up in the middle of the dream and looked at my clock. It was exactly 5:55 AM, and I felt sharp, pulsing pains to the right of my heart chakra! I put my hand there and asked for the pain to go away, which it did instantly. I got up and pulled out my beautiful Calcite stones, and have had them nearby ever since. I think this message is not just for me, but for all of us. Working with Calcite right now can help us with healing and clearing, and with integrating the accelerating energies of March and beyond. Calcite can be used to clear, balance, and activate all of your chakras. Clear Calcite can be used to bring any chakra into a state of perfect clarity and functioning, or you can match the color of the Calcite to the color ray of each chakra. Maintaining your chakra system is vital during intense energetic periods. Calcite is an energy amplifier. During periods of heightened cosmic energy, your body can experience ascension symptoms and fatigue. Calcite can give your body the boost it needs to move through it. Calcite has a soothing and stabilizing effect on the emotions. This is especially helpful when the planetary energies are accelerating and bringing issues to the surface. Calcite will help to alleviate any stress and fear, centering and balancing you so that you can calmly face situations and move forward appropriately. Calcite can sharpen the mind and amplify your powers of manifestation. Eclipses and equinoxes are perfect times for focusing on what you want to create or experience next. Calcite sharpens your mental body, making your thoughts crystal clear. It also acts as an amplifier of energy and thought-forms, making it the perfect mechanism for placing your order into the Universe for accelerated manifestation results. Calcite can link the emotional and mental bodies, increasing emotional intelligence and heart-based living. This is the way of the higher dimensions, and right now we can make a quantum leap in transforming our personal realities into a more loving and holistic expression. Calcite accelerates your spiritual growth and psychic development. The veils are always thinner when we are in an eclipse or equinox window. Working with Calcite at this time can help you to tap into higher dimensional realms and to integrate new light codes that are available now. It can help you upgrade your spiritual gifts, taking them to a new level. Calcite can support the physical body in eliminating toxins, boosting the immune system, and decalcifying the pineal gland. Your body may need extra support right now as it attempts to release from a deep level and align with the light. Calcite will help your physical vehicle shift with more ease and grace. Calcite can help you to reestablish your higher blueprint of perfection. Calcite is known to help you remember your original state of perfection–before disease, trauma, or negative patterns developed. It helps to guide your body, mind, emotions, and spirit back into wholeness. Now is the time for this work! Calcite can clear your home environment or work space. The equinox ushers in springtime, and It’s time to do a little spring cleaning! Placing Calcite in your home, office, or any place you spend time in regularly will help to purify, refresh, and uplift the energy. So march forward into the new normal this month with Calcite! It will put some spring in your step, while bringing lots of light into every aspect of your being. Crystal Divination: What Does 2016 Hold in Store for You? Call in your higher self and move your consciousness into your heart. Take a few deep breaths, and then look a the photo below. 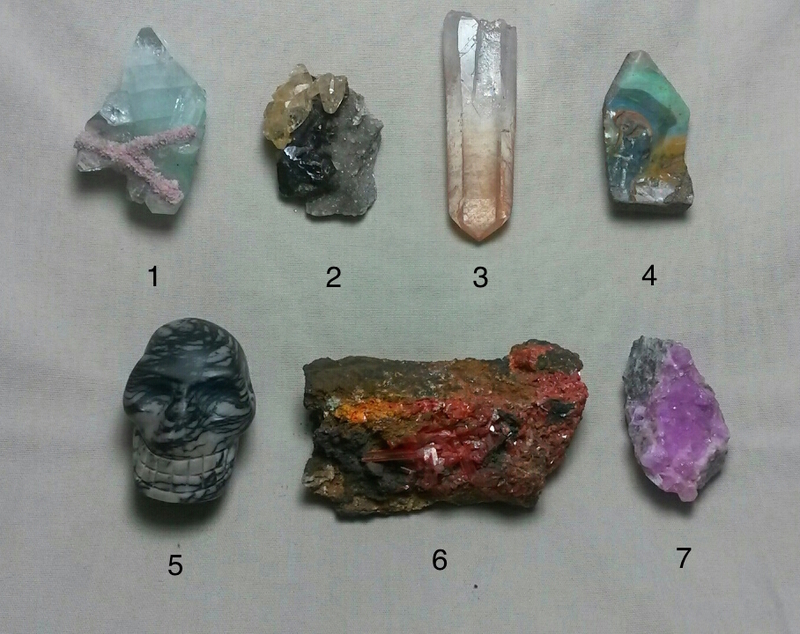 Which crystal are you most instinctively drawn to? Try not to analyze or think about it too much. Instead, allow in your higher guidance. Tune into your intuition, and feel out which one is calling to you the most. Once you have your number, look below the photo to access your mini crystal reading for 2016. (Having a hard time choosing just one? Try to narrow it down if you can. But go ahead and read the messages of any others you like, because they might also apply to you.) Enjoy, and remember that you always have the power to make your life beautiful! 1. Apophyllite: Integrating Higher-Self Aspects and Merging Timelines. Your energy is like this beautiful Apophyllite–very pure, high, coherent, and connected to the higher realms. This is because you are an advanced, multi-faceted soul who has spent many lifetimes refining your energy and gaining experience and wisdom. This Apophyllite crystal you have chosen has a big clue written right on it that symbolizes what you will experience in 2016. See the big pink Y across the bottom of the crystal? It represents a merging or an integration process (two lines coming together to make one). You are now ready to physically embody more of the totality of your oversoul. During the first part of 2016, be ready to receive a series of major soul downloads. They are designed to activate latent talents and metaphysical abilities, while also bringing in higher-perspective information and solutions. You will begin to integrate the higher aspects of your soul matrix that are most helpful and relevant to your current lessons and your true mission. For example, let’s say that your highest calling in this lifetime is to be a healer. You might begin to integrate and remember the specific techniques of an ancient healing modality that you mastered in other lifetimes. Or perhaps you will start to naturally channel a new and unique array of healing energies that your soul can access. It will be important for you to honor your body and to pay attention to its signals during this integration process. To make room for more of your higher self to merge with you, you might experience a clearing process and ascension symptoms (such as headaches and other pains, digestive issues, flu-like symptoms, fatigue, increased sensitivity, waves of anxiety or depression, the surfacing of old emotions, etc.) It will pass, and when it does you will be clearer and more attuned than ever. Choosing this Apophyllite crystal also points to another fascinating potential for you, which relates to merging with an alternate reality or timeline. What if there are multiple versions of you living out every possible path and option in different threads of reality, known as timelines? What if there is a timeline, not too far-removed from where you are now, in which you are having a better experience? Is there a way to fold yourself into that version of reality–to align your current vibration so completely with it that the two timelines merge into one? Your soul knows exactly how to do this; and believe it or not, you have done it before! You have the potential this year to partner with your soul in order to consciously merge your current reality with a new, happier, more triumphant timeline. Your imagination is actually a mechanism for viewing these alternate timelines, so daydreaming about the life you want to experience is a good place to start. Your higher self will fill you in on the rest of the process, if you listen. As you enter this year of integration and merging, remember this higher truth: You are already one with all that is. When you can consistently hold this truth in your heart and consciousness, your life experience will mirror it in awe-inspiring and magical ways. And everything will literally come together. 2. Sphalerite and Stellar Beam Calcite: Cutting through Illusions–Receiving Clear Visions and Becoming an Agent of Change. “The truth is stranger than fiction.” We find ourselves in a perplexing reality that can sometimes feel like navigating through a hall of mirrors. Distorted reflections of the truth are proliferated through societal institutions, such as the media, the internet, religions, and governments. Even taking an honest look at yourself and your personal reality can be a challenge when the larger belief systems are clouding the lens of your vision. The good news is that the higher truth is always right beneath the illusions, available to you when you bravely reach for it. You are an old soul who is a bright and curious spiritual seeker. You have had incarnations in which you studied in the great mystery schools and were at the cutting edge of esoteric thought. In those lifetimes, you achieved a high level of consciousness and grasped many advanced spiritual concepts. Your soul’s quest to fully understand this reality has also inspired you to diversify your resume of incarnations, ensuring that you experienced multiple cultures, vocations, and levels of privilege. You can draw upon everything you have learned to serve you now. During this pivotal time in cosmic history, we are in the midst of a grand upshift and dismantling process on both personal and planetary levels. Many of the old systems and ways of being were built upon a shaky foundation, like a house of cards destined to fall. From one perspective, those at the top who benefit from the status quo are trying to keep it together with scotch tape and slick marketing. But you aren’t buying it! You have an amazing ability to see or to feel your way through complex situations, because you have developed a keen sense of discernment through your soul’s experiences. Your gifts of perception and deeper insight will be especially useful this year in helping yourself and others to see through layers of distortion, illusion, and misinformation. And most importantly, you can help to illuminate how it is all a part of the bigger plan. It serves the divine purpose of bringing us back into a higher state of love and unity. Part of your mission is to be an agent of change–to help create a map that leads to us back to wholeness and to higher dimensional living. We are all being asked to step up and make necessary changes right now, so start with yourself. Go within, and ask to be shown where you are out of alignment and if you are deceiving yourself in any way. Are you staying in relationships, jobs, and roles that you know deep down are not right for you? Are you being honest with yourself about your feelings, desires, and life circumstances? Make any necessary course corrections early in 2016 to bring yourself into greater integrity. This will result in a huge expansion of your spiritual gifts and level of understanding this year. Many people will be naturally attracted to you, because you are increasing your capacity to help others through the mazes they have created in their lives. You could easily become very successful in the fields of life coaching, counseling, or healing. You have the ability to help people one on one in private sessions, or you could even create programs, workshops, and books to reach the masses. Also, you will start applying your skills to see through bigger picture illusions. For example, you might start tuning into the higher truth behind complex questions like these: What is really driving the conflict in the Middle East? Why does everything appear to be so polarized in politics? Is the world actually being run by lizard beings from behind the scenes? Which spiritual teachers and leaders are really tuned in and telling us the truth? You have the potential to really go down the rabbit hole and get to the bottom of things. And the higher insights that you share might be just what the world needs to wake up. 3. Starseed Quartz (Dow Master Formation): Embracing and Sharing Your Galactic Nature to Help Upshift the Planet. Do you ever feel like the entire earth might as well be a foreign country to you? Perhaps it is because your soul journey did not originate here, but on another planet instead. It is no accident that Starseed Quartz spoke to you. Even though it might not be evident in the photo, this crystal is covered with strange etchings on alternate faces. Some of them are geometric, and others look like comets and cosmic morse code. They represent light codes and information of an extraterrestrial origin that imprinted upon and manifested inside this earthly vessel. Choosing this crystal indicates that you have likely had several incarnations in other star systems. Tune in for just a moment, and see if you naturally feel a resonance or connection with any of these ET races: Pleiadians, Sirians, Arcturians, Andromedans, Alpha Centaurians, Lyrans, Vegans, Orions, the Essassani, Cassiopeians, Avians, and Felines. This is just a small sampling of possible races that you have been a part of in this vast universe. Because of this, you naturally have otherworldly, metaphysical talents and a unique level of brilliance that can help you shine in many professions and roles. Your advanced and adventurous soul heard the call of Gaia, and you were drawn to incarnate here at this time to share your gifts, consciousness, and vibration in planetary service. You function much like this crystal you have chosen. Your other-planetary experiences and energetic signatures as a starseed are etched into your soul matrix, and what you carry has value for Earth during this transformative time. This crystal is also a rare Dow Master Quartz, which means that it has alternating triangular and seven-sided faces. Its physical formation embodies symmetry and perfection, and it is a crystal that is capable of receiving, containing, and projecting the information that has been programmed into it. In an nutshell, your higher calling is to hold, amplify, and radiate your unique stellar frequencies and codes, so that they are anchored into the earth grids and made available to help upshift the planet and all sentient beings here. No pressure–you do this quite naturally by just being you and being here. However, if you want to be a rock star, you have the opportunity to more consciously step into this role and to share it in even bigger ways this year. If you haven’t already begun, a good place to start is with meditation. First, form a clear and protected connection with your higher self. Then ask to be in touch with your own galactic aspects and starseed lifetimes, especially those that are relevant to your current mission. Allow your higher self to give you information in whatever forms you can most easily perceive it. Perhaps you will get visual information, such as images of other planets, beings, or symbols. If you are clairaudient, you might even hear words or language from another world. You might feel cosmic vibrations of activation or just get a direct knowing or download of information. Be sure to ask what to do with whatever comes to you. Maybe the symbols that you saw, the language that you heard, or the energies that you felt are meant to be shared. Perhaps they can help to activate, heal, balance, or recalibrate certain places or groups of people. You might feel compelled to do this work alone, or perhaps you are destined to stand in front of large audiences and share your gifts. Allow your masterful higher self to be your guiding star. 4. Opal: Going Within–Exploring and Actualizing the Magic of the Subtle Realms. There’s a rainbow inside your mind! Gazing at this enchanting opal is like having a third eye awakening experience. Perhaps at first glance, you notice splashes of surprising color combinations swirling together in pleasing harmonics. If you allow your consciousness to dive into a particular color band, you can get lost in the subtle variations of shade, brightness, density, glassiness, and glitter. As you slip deeper into a trance, coherent images pop out to greet you: a dolphin, an iridescent heart, a sunset, faces. It’s like a shamanic journey or a work of art in a stone! Choosing it indicates that you are naturally tuned into the subtle levels of reality. This is an ability you gained through lifetimes you spent as a shaman, priest/priestess, holy person, artist, and/or creative person. This year, you will follow your inner inspirations and allow them to take shape as magical journeys and colorful, expansive experiences. Your soul has put you on a fast track this year to raise your vibration in the most joyful and miraculous ways. It is already lining up for you magical synchronicities in the form of chance meetings, repetitive signs from the Universe, and new opportunities that seem to come out of nowhere. It is your job this year to pay attention, to interpret the data, and to follow the flow. This is actually a co-creative effort between you and your higher self, so be sure to do your part. During the first few months of 2016, make plenty of time to go within on a regular basis. Connect with your inner self in whatever way works best for you: meditation, shamanic journeying, writing, creating art, movement, listening to music, being in nature, etc. If old memories or emotions come up during your inner work, that’s great! Allow yourself to feel them, express them, move through them, and release them. Ask your higher self for any healing or breakthroughs in understanding you need to move on. You are just making space for the new. Also, make a conscious effort to daydream and to get in touch with ideas and inspirations that bring you joy and excitement. Approach it with playfulness, like the dolphin spirit that appears in this Opal. In doing so, you are surfing real potentials and exploring the limitless sea of possibilities. When you hold your focus on a vision you like, you are placing your order into the Universe for what you want to experience next. Don’t worry about how it will come about, that’s where the behind-the-scenes magic comes in. Your brilliant soul is connected with the entire energy matrix of the planet. Therefore, it can help to line everything up for you and bring you every resource you need. It can ensure that you meet all of the right people at the right time who have a piece of the puzzle for you. It can put the right professional, educational, or travel opportunities in front of your face, or compel you to go all to the way to other side of town to buy a lottery ticket that happens to be a winner. Your job is to tune into these subtle messages and inner promptings, to trust your gut feelings and intuitions, and to follow through with action. If you do this, you will find that your year will be filled with unbelievable stories, plot twists, breakthroughs, and adventures that will land you in an entirely new energetic and physical territory by 2017. Welcome to the magic of the 5th dimensional living! 5. Network (or Spider Web) Jasper Skull: Using Your Gifts to Heal and Recalibrate the Energetic Blueprints of People, Places, and Systems. Reality is an intricate, energetic web through which all things are connected. It consists of layers of interlocking systems–grids within grids held together by sacred geometry–on both a micro and a macro level. You are a brilliant soul who, on a higher level, is an adept in the fields of sacred science and mathematics. You have a special ability to tune into the unseen templates that underlie reality. Everything is vibration, and all vibrations have patterns. Your higher self exists beyond the confines of 3-D and knows exactly how to view the wiring beneath the board, to see the detailed energetic grid-work that holds matter into form. Your soul can sense exactly where distortion or disharmony exists in many kinds of biological matrixes: physical body systems and organs, emotional and mental bodies, auric fields, chakras, and other subtle layers of the energetic system. It also has the ability to tune into the patterns and morphic fields of planetary energy systems (the vibration of places, ley lines, and power-spots, etc.). It can even view the energy blueprints of institutions, governments, businesses, organizations, and other societal structures. Your soul broadcasts this data to you, and that is why certain people and places feel comfortable to you, while others do not. What’s amazing is that your soul can also stream through you the perfect higher dimensional patterns, codes, and energetic threads necessary to mend and upshift any distorted templates that you encounter. This is one of your higher callings–to bring in the right symphony of energies needed to restore and upgrade people, places, and systems. The way you do this can manifest in many forms. Perhaps you are called to channel harmonious energies through sound, visualization, or energy healing. Maybe your work will take a very tangible form. You might be called to design buildings, structures, and art based on the principles of sacred geometry. Or perhaps you are a crystal grid builder. Crystals have a highly geometric and coherent structure, and so they radiate pure, high frequencies of light. When you network them together in a grid, you are creating a powerful forcefield of energy that can positively affect large areas. Choosing this Network Jasper skull also suggests that you have a natural connection to the crystal skulls, probably as a result of working with them in other lifetimes. This skull has been charged by the ancient crystal skull named Synergy, a beautiful artifact that contains Lemurian energy. It is recommended that you do some research about Synergy, because it might trigger your remembrance and connection with this ancient skull. Quartz material has the ability to store, amplify, and transmit energy and information. The ancient crystal skulls contain the blueprint of the Divine human prototype, the fully expanded human being with all twelve DNA strands activated. They have also been deliberately programmed with cosmic and planetary records, ascension codes, and vast amounts of data. If you don’t already own a crystal skull (or several), consider getting one in 2016. All of the crystal skulls on the planet, both ancient and modern, are forming a unique energetic network. Through intention, you can link your personal crystal skull to the larger crystal skull network, allowing it to download the transmissions, frequencies, and codes that are most appropriate for your spiritual expansion and highest good. Your crystal skull can amplify and assist in the work you are doing to heal and recalibrate energetic blueprints. This is your year to be like the spider, weaving breathtaking geometric patterns into the energetic fabric of your world. And what you do will ripple through the entire web of creation in the most transformative ways possible. 6. Crocoite: Moving Forward–Making Big Personal Breakthroughs and Healing Core Issues. You are a powerful, dynamic, and generous soul who is here to make a positive difference in the world. Before you incarnated, you understood that it wouldn’t always be easy. You knew that you were incarnating with a veil of forgetfulness into a planetary matrix that, from one perspective, is riddled with distortions, inequities, and lower energy traps. You also knew that this time period marked the shift of the ages. You didn’t want to pass up this unparalleled cosmic opportunity for growth–the chance to bring love, light, and higher dimensional solutions to this beautiful piece of creation. Because you love the earth so much, you said, “Bring it on! Not only do I volunteer to go down there, but I will even take on some extra challenging patterns and situations so that I can help transmute them for the whole of humanity. Somebody’s got to do it, and I know that I can succeed.” So here you are! You have beaten the odds and awakened so much of your higher spiritual understanding and abilities. You have bravely embraced the path of transformation and growth, and you have been working diligently to heal old patterns and to shine the light. Maybe you hit some rough patches in the last few years, as the planetary energies accelerated and brought lessons to you. From a higher perspective the lessons are set-ups. They were put in place so that you can overcome them and fully embrace the truth–that you are a spiritual master with unlimited potential! You also chose to master these lessons to help raise the collective planetary vibration, and to be a living example and inspiration for others going through similar things. Perhaps your lessons have expressed as a physical health issue, an addiction pattern, or a financial struggle. Maybe you have been facing unhealthy family or relationship dynamics, or perhaps you have been dealing with grief, depression, loneliness, or anxiety. If you have been feeling stuck in any major area of your life, 2016 brings you good news! You have been making more progress than you might realize, and this year you have massive potential for positive breakthroughs and the total healing of core issues. It is the year of personal liberation and forward movement for you. Your soul loves you so much that it simply will not allow you to stay stuck in patterns or situations that keep you down any longer. Prepare to be blasted with the life force energy, clarity, motivation, and focus you need to surmount anything in your life that is less than joyful. Deep down, you probably already have an idea of what you need to do to improve the quality of your life. Your higher self has been giving you messages for a while, and this year they will get even louder and clearer. Flashes of insight and brilliant solutions will come in to fast-track your progress. You will receive whatever you help you need to melt away any lingering resistance or self-doubt that would keep you from action. Life will present you with every resource that you need, and most importantly, you will discover your own inner resources. This particular lifetime is graduate school for you. You are completing some very advanced course work that many are not capable of even attempting. Keep up the good work, and you will graduate with honors! As you pass each test, expect positive new connections, experiences, opportunities, and metaphysical abilities to come in as a result of moving your energy into a higher vibration. You will wear your big soul achievements like the sunshine. The rays of your success and the wisdom you have gained will beam out to touch and inform the entire collective consciousness, uplifting the whole and unlocking higher potentials so that others can do the same. 7. Cobalto Calcite: Perfecting Your Emotional Body–Aligning with the Heart of the Divine Feminine and Your Highest Path of Service. You have a heart of gold and the soul of an angel! Your energy matrix is like a divine mandala of pristine, celestial vibrations that carries the patterns of unconditional love and compassion. You are an intuitive person who feels things deeply and might identify as an empath. One of your dominant metaphysical abilities is to sense the world through your heart, which allows you to easily feel into people and places. You are the first to notice if the vibe is off in a room, or if somebody is not feeling alright on any level. And because of your deeply caring nature, you are inspired to do what you can to uplift the energy or to help the person. This heightened level of sensitivity is a soul gift. You can use it in many ways to be in service to others. Your intuitive and empathic abilities make you a natural healer, a role that you have embraced in many forms in other lifetimes. There is no calling that is higher than helping people to become more peaceful, loving, healed, and whole. The nature of this reality is holographic, so when just one person moves into a higher state of well-being, it touches and benefits us all. It is likely that you have already helped several people to heal issues and to raise their vibration and consciousness. You naturally do this by being present for them, listening, and showering them with love, compassion, and care. Or you might even do this in a professional capacity as a healer, counselor, or caretaker. You are destined to touch many more lives in a healing way, and by doing so you are helping to transform the world into a kinder and more loving place. To be as effective as possible this year, it is important that you bring your heart and your emotional body into the highest level of perfection and clarity that you possibly can. This is because the highest gifts you are able to share come from and flow through your heart chakra. So be sure to turn that love inward to heal yourself first and foremost! As a sensitive, you naturally feel things deeply and might have some residual emotions from past experiences that you need to process and to lovingly release. Some of the lower emotions and pain you are carrying might not even be yours! You might have subconsciously absorbed it from others in an attempt to lighten their load. It is time to let go of anything that is burdening your heart. Allow your loving soul to grace you with the vibration of forgiveness, which has the power to transmute anything that is less than love. As your heart chakra becomes crystal clear, you will find that you have a very natural connection with the Divine Feminine, and it is becoming even stronger. You are a part of her, and she wants to work through you to help anchor onto the planet her higher qualities of compassion, healing, intuition, nurturing, unity, and deep care. There is a special role she has in mind for you, one that you are uniquely qualified to do. You might already have an idea of what that is, and you might already be doing it. If you need more information about your highest path of service, try meditating with a Cobalto Calcite at your heart chakra. It will help to illuminate for you your greatest soul talents and your highest calling. Love is the greatest force in the Universe, and this year it will bring every facet of your life into full bloom. The Zeal Chakra (also referred to as “The Mouth of God” or “The Well of Dreams”) is located at the back of the neck and the base of the skull, where there is an indention. It is an ancient chakra that has been dormant, but is now beginning to awaken. Its color ray is magenta. When it is fully activated, this center will regulate multi-dimensional telepathic communication. Awakening the Zeal Chakra assists the kundalini in rising, and you experience an increase in clairvoyance, clairaudience, astral travel, vivid dream-recall, healing abilities, empathy, and telepathy. It is also known as the ascension chakra, and I love that it is coming online for so many right now. If you have been experiencing strange sensations in this area, or tension in your neck and shoulders, it might be a result of your Zeal Chakra beginning to awaken. Not much is written about crystals for activating this chakra. The only suggestions I found were Pink Tourmaline and Clear Quartz, but I had a feeling that there might be something even better. So I have been trying different stones to help this process along, and I found one that is really working wonders–Eudialyte! Eudialyte is a physically and energetically complex stone that ranges in color from magenta, pink, rose, red, yellow-brown, violet, green, and red-brown. According to crystal expert, Melody, when Eudialyte is held for at least one hour, it has been demonstrated to measurably increase both the alpha and beta states. The beta state is your everyday, alert level of consciousness, and the alpha state is your creative, daydream state. In alpha, you are accessing your imagination, intuition, and higher dimensional connection. Eudialyte helps you to develop telepathy, clairvoyance, clairaudience, and channeling abilities. It serves as a fine-tuner of transmissions, helping you to hone in on the important incoming vibrational information, while tuning out any extra noise. It is known to increase the flow of synchronicities in your life. 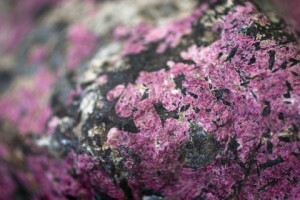 Eudialyte also clears the channel from the crown to the root chakras, encouraging the kundalini energy to rise. It harmonizes your mental and emotional bodies, and it connects your spirit body with your physical experience. Eudialyte attunes you to greater levels of universal love and joy, while helping you to express these energetic states in your physical life. Place Eudialyte at the Zeal Chakra, and leave it there for a minimum of fifteen minutes at a time to help activate this important and emerging energy center. We will be doing this, and many other amazing crystal exercises, in my upcoming class, “Partnering with Crystals to Shift Your Energy & Your Life.” The early registration discount ends on Saturday, September 26th, so head on over to my Events page and sign up today. I hope to see you there!